Because motorcyclists are far less protected compared to drivers of traditional vehicles, they are more likely to sustain serious injuries. It is important to consider where the most serious injuries are likely to occur so that you can protect yourself accordingly. Some common injuries resulting from motorcycle accidents can include spinal cord injuries, traumatic brain injuries (TBI), road rash, bone fractures, etc. By being aware of these injuries and how they occur, you can protect yourself – whether this is through defensive driving, wearing the proper gear or driving more safely. According to the CDC, 30% of all non-fatal motorcycle accident injuries occur on the legs and feet. Road rash is a common example of a lower extremity injury, and is most common among riders who do not wear proper boots or pants. An additional 22% of all non-fatal motorcycle accident injuries occur to the head and neck, making them the second most common of all non-fatal injuries stemming from motorcycle accidents. 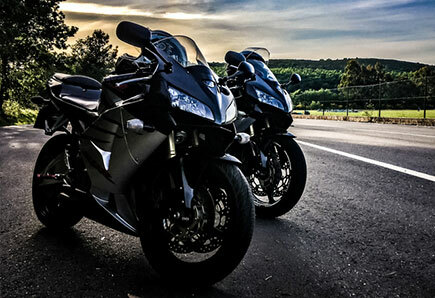 Following these, the next most common injuries that stem from serious motorcycle incidents are upper trunk injuries (which can include chest injuries), shoulder injuries and back injuries, arm and hand injuries, followed by lower truck injuries (which include the hips and the pelvis). A study conducted by the AAAM set out to determine whether there were differences in injuries between young riders and older riders, while tracking injuries related to the use of helmets. The study tracked all motorcycle riders who were injured in Maryland between 1998 and 2002, based on police reports and hospital discharge records. The study revealed that riders with helmets suffered less severe injuries and a smaller number of more severe injuries. The study also reported that the most common causes of death were injuries to the head, the thorax, and the abdomen. Traumatic brain injury was a common cause of death from serious head injuries. There are many steps you can take to protect yourself from a motorcycle accident, including driving defensively, wearing the proper gear, and keeping yourself visible when on the road with other vehicles. If you have been involved in a motorcycle accident, and you believe that you may need a motorcycle accident attorney, the best thing that you can do is to pick up the phone today and call Inland Empire Motorcycle Law at (951) 290-3664. Our California motorcycle attorneys are motorcyclists who are passionate about both the law and motorcycling, so we can advocate for you from both sides. Give us a call today to learn more about what we can do for you.